— Buddy DeFranco: Generalissimo / Live Date! — Fats Waller: If You Got to Ask, You Ain't Got It! • The Penguin Guide to Jazz considers the albums on their list to be essential to any serious jazz collection. I make no similar claim, not even for my own jazz collection. These are simply my favourites. I certainly recommend each and every one of these but I also appreciate that failing to pick up a copy of MJT+3 may not go down as a profound regret to carry with you to your dying day. • Bix Beiderbecke Volume 1, Art Pepper Meets the Rhythm Section and Time Waits were all purchased by me in the past year. While it certainly is possible the gloss may well wear away in the years ahead, I can't see it happening. Other recent discoveries such as Shelly Manne's My Fair Lady, George Shearing's Complete Savoy Trio and Quintet Sessions and Jabbo Smith's Complete Hidden Treasure Sessions have impressed me but they weren't given much consideration. • I hate to say it but the artists who appear more than once were probably held to a higher standard than the rest. Armstrong's Hot Fives and Sevens and his Ellington collaboration The Great Summit probably ought to appear as well but I don't get the same enjoyment from them than the three that appear. Same goes for Ellington. Davis' situation is slightly different since I'm largely going on memory. A sizeable chunk of my jazz CD's went missing a while ago and I'm forced to go by those that stand out most in my memory. Having said that, maybe there's something to making selections based purely on recollections. Walkin' and Miles Ahead are the two albums of his that I miss the most while I was so devastated by losing Nefertiti that I picked it up again almost immediately after I knew it was gone for good. In a Silent Way was a late addition to the list because it's not one I have much of an inclination to re-purchase but the impact it had on me back when I first listened to it in 1998 was pretty significant so it got an eleventh hour push. 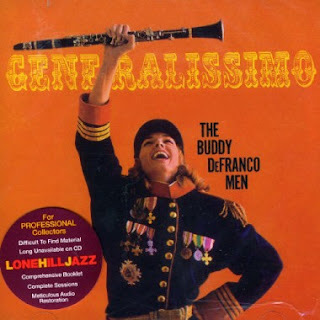 • Seeing as how this entry is supposed to be about Buddy DeFranco's Generalissimo / Live Date!, I suppose I should state my reasons for including it. Firstly, it's probably my favourite album on my iPod - and the vast majority of the above are on it too. I take a lot of long bus rides and the jaunty, almost playful bop - particularly on the Generalissimo half of the two-fer - is the perfect antidote for many a long, boring commute. His version of the standard 'Sunday', which is the opener, swings beautifully and DeFranco, Barney Kessel and Sweets Edison all account for themselves very well. Even Hebie Mann, showing up on Live Date, does surprisingly well for himself. Second, it's given me a whole new appreciation for the clarinet. I admire the fact that DeFranco persisted with the licorice stick when it had clearly fallen out of favour in the post-Parker landscape. And, finally, it feels like an event, an important work by a major figure. I'm convinced that DeFranco and his co-horts knew they were doing something special on both of these April, 1958 sessions. The trouble is, I like it too much and feel I cannot adequately critique it as a result. As an outtake, here's the opening paragraph of my intended piece. Hopefully I can get my act together in the near future and do this fine musician the justice he deserves. Until then, appearing on a lowly blogger's Core Collection will just have to do. "I said 'Coltrane okay, but I want to use all the musicians that I want.' I wanted to use Ted Curson, who's a much more contemporary trumpet player than the trumpet player I ended up with, Kenny Dorham." Coltrane okay? That's quite a ringing endorsement there, Cecil. Stereo Drive, aka Hard Driving Jazz, aka Coltrane Time, is an album of a few aliases and a couple leaders - or so we've been led to believe. Nowadays it is easiest acquired as a Blue Note release under Coltrane's name but upon its inital pressing in 1959 this was a Cecil Taylor session and album (the above cover credits the tenor sax to one "Blue Trane"). 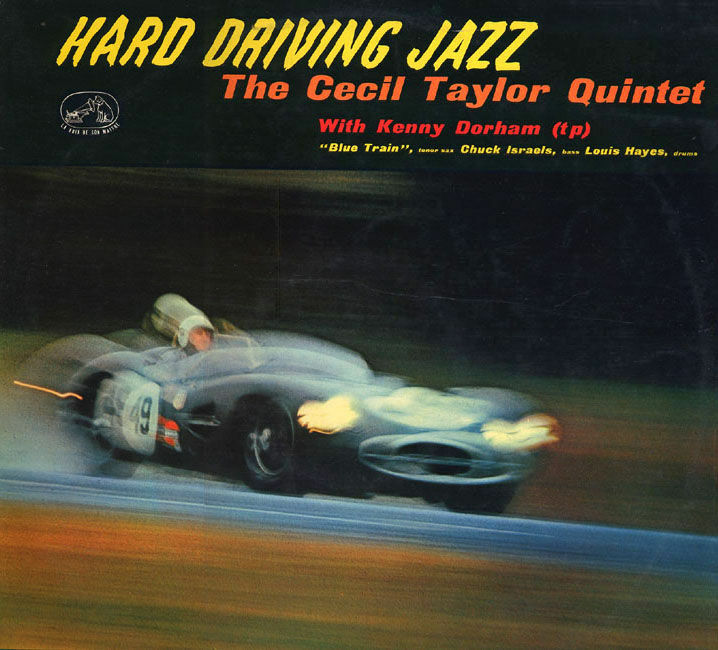 My own copy, released by the Spanish label Gambit Records, credits it as "Cecil Taylor with John Coltrane", a rather nice compromise to be sure but the bonus six bonus cuts are all from Jazz Advance, Taylor's breakthrough release from two years previous - a sign, if any were otherwise needed, that Taylor was the man in charge. 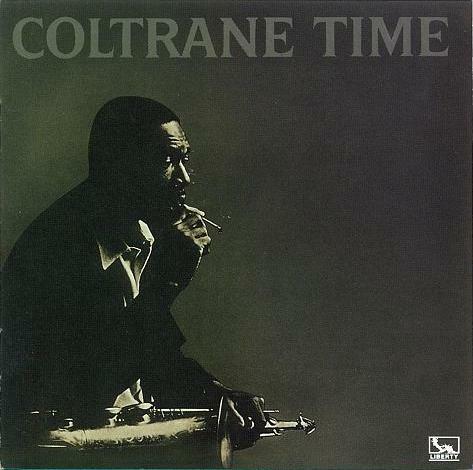 If I were to guess I'd say that Coltrane's co-credit is shore up some interest from casual buyers - and, indeed, that was my primary motivation for investment. Given that he was using an admittedly feeble alias - I imagine in order to appear on a rival record label's release, much like "Charlie Chan" on Jazz at Massey Hall - and the fact that his name appears in smaller print than even the supposedly unwanted Kenny Dorham, there's no way that the optics of the time could persuade you to believe that this is a Coltrane session with Taylor guesting. But what about if you pick up a copy of Coltrane Time, how would having his name as part of the title and his picture on the cover affect one's perception? Well, given that he is the first soloist on opener 'Shifting Down' - notably a Dorham composition, curious that Taylor would use a number by a musician that he didn't want to be there in the first place to commence the album - is Coltrane then you could be forgiven for making this assumption. The lack of lengthy, ponderous tenor solos must be seen in the context of albums from his pre-Atlantic period and the fact that he had also been playing second fiddle to both Miles Davis and Thelonious Monk: Taylor and Dorham are hardly Jimmy Garrison or Reggie Workman, there to serve every need and desire of the guru on tenor sax. So, could this album have been called something like Kenny Dorham in the Driver's Seat, with the trumpeter being credited as leader? I don't see why not. Miles Davis once complained that Thelonious Monk would never lay out during his solos and the Dorham-Taylor relationship is reminiscent of this dysfunctional dynamic - but the pianist seemed just as willing to go on playing what he liked while Coltrane took the lead as well. Reviews suggest that Dorham disliked Taylor's playing just as much as Taylor disliked his and indicate a certain tension to the recordings as a result but I don't hear it. Certainly their styles often clash and I'm sure their personalities also failed to mesh but since when did collaborators have to be best friends and musical bosom buddies? Perhaps failing to live up to the vision Taylor had initially in mind, Hard Driving Jazz works rather well precisely because of the contrast of styles and antagonism - and this is only reinforced by the bonus tracks. Whereas Cecil Taylor left in charge of a more sympathetic group of musicians often sounds impressive but aimless, this makes it obvious that his unique talent lends itself much better alongside individuals with whom he disagreed. And so too does Coltrane. And, dare I say, so too does Dorham. This is a makeshift incarnation of the Plastic Ono Band looking almost as if they're aware of what's going on. It's a fascinating photograph but probably not for reasons that may be initially assumed: I love the fact that I can name all of about six people in it. That's a double-chinned Eric Clapton about to whisper something slurred and incomprehensible into Lennon's ear and George Harrison standing above him, looking as cheerful as ever. 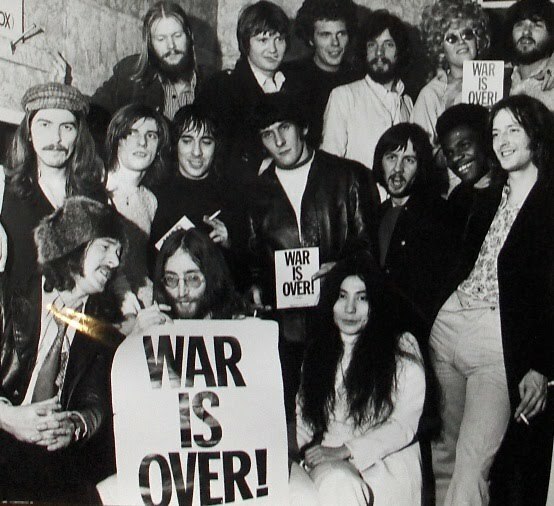 Keith Moon is unaware of just what's going on and, finally, there's Billy Preston who mostly stands out due to his skin colour (it isn't just Yoko Ono's ethnicity and gender that distinguish her from the rest of these rogues, it's the fact that she appears refreshingly unconcerned with the proceedings). I suspect that's Pete Ham or another minor member of Badfinger in front of him at the far right but I can't be certain. I should acknowledge that possibly at this very moment there's a girl called Laurie or a boy called Christopher who's looking at their Grade 1 class picture and wondering just who the hell the buck-toothed bean pole is and in that respect I can fully empathize with the individuals in the back row. 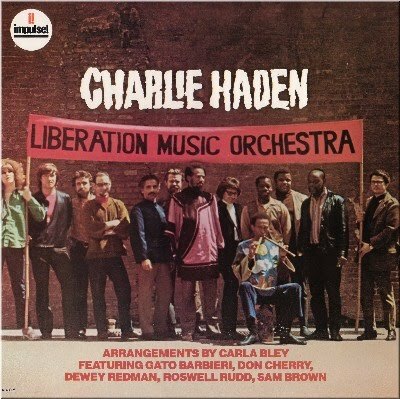 Perhaps sensing this, Charlie Haden's Liberation Music Orchestra makes a game attempt to tackle issues while maintaining an admirably high standard of musical creativity - at least some of the time. The second side lags largely due to dullness on tracks 'Song for Ché' and - a particular disappointment - the otherwise outstanding Ornette Coleman composition 'War Orphans': in the case of the former, Haden's obvious admiration for Guavara probably puts him too close to its subject as the performance commences with him trudging through an over-long bass solo before finally moving on to some free-form nonsense courtesy of Don Cherry and Dewey Redman; the latter just drifts along, as if waiting for someone in this thirteen-piece orchestra to do something - a curiousity considering the foundation of this outfit was formed around Coleman offshoots. Once again, Haden's heart is probably at too close of a proximity to the subject matter to make objective creative decisions. Haden's vision for the album is stirring but muddied and this is probably why Carla Bley was such a boon to these sessions. The Spanish Civil War medley 'El Quinto Regimento/Los Cuatro Generales/Viva la Quince Brigada' is the highlight and, as twenty-minute tracks go, is surprisingly concise. The whole thing is held together by Sam Brown's guitar and Bley on piano and they manage to keep the free-form madness from getting too out of hand. Gato Barbieri's section is especially memorable and it reminds me of some of his equally wonderful work on Cherry's minor masterpieces Complete Communion and Symphony for Improvisers. (It's possible that he knew how to best combine Haden's passion with Bley's professionalism, which seemed to have escaped the rest of the orchestra.) The shorter numbers - Bley originals 'The Introduction', 'The Ending to the First Side' and 'The Interlude (Drinking Music)', as well as shots at 'Song of the United Front' and 'We Shall Overcome' - are all great call-to-arms hum alongs with some stellar group playing: nothing gets especially out of hand but the rebel rousing isn't compromised one bit. If anything, the best case for the revolutionary spirit of Liberation Music Orchestra is in these numbers. Similar to the way an actor or singer will coyly smile into a camera that strays into the audience at an awards ceremony, the figures in the Plastic Ono Band picture seem convinced that you know who they are - which obviously makes my ignorance as to their identities all the funnier; the Liberation Music Orchestra personnel don't appear to care whether you're able to recognize them or not. They cared about making a statement and creating some lovely music. At least they tried. There is a persistent notion floating around - not necessarily false, mind you - that Duke Ellington's charges could never cut it on their own. Clive James notes that the very success of the marvellous Blanton-Webster period proved it's undoing: everyone became a star and they were all keen to show what they could do without the taskmaster present. While James doesn't go into it, I have to believe that Ben Webster's career path proved to be the kernel that triggered everyone else to follow suit: having worked alongside him - and in direct competition with him at the exact same time - did this light a fire under, say, Johnny Hodges, promting his departure from the Orchestra in 1951? A master manipulator, Ellington did little to difuse the friction amongst members of his Orchestra; the blow-back may have prompted everyone to emulate the success of their most renowned compatriot. 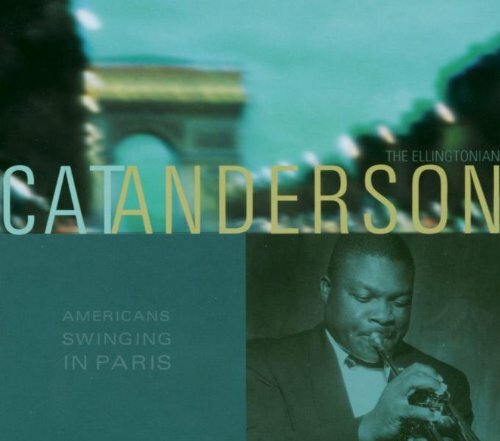 Cat Anderson wasn't a part of the early-forties peak, having joined Ellington in 1944 (possibly as a permanent replacement for Cootie Williams, who had fled to form his own orchestra, but I don't have sufficient resources at my disposal to say one way or another), but he still would have been privy to plenty of friction and ego. Much like later addition Paul Gonsalves, while he did clearly have the ambition to go off on his own, this was done much more sporadically and if this compilation is anything to go by he was out to prove just how intrinsic Duke was to his own sound. But this is slightly less aparent earlier on. Chronologically speaking (for it doesn't come in until the second half of the disc), the first Paris session in 1958 takes a reasonable stab at 'Concerto for Cootie' before unleashing some steller solos on 'Black and Tan Fantasy' - about as individual and free of his boss as it gets. Anderson's patented trumpet plunger sound is present but not as often as one might expect. Russell Procope and Butter Jackson certainly keep pace with Anderson as well. The remainder - 'Blues for Laurence', an original, and versions of 'Ain't Misbehavin' and 'You're the Cream in My Coffee' - sound remarkably as if they were all Ellington arrangements in secret - a testament to Anderson's underrated abilities in this regard.he did have a pretty gifted mentor to show him the ropes. The centrepiece of the collection, however, is the 1964 session and the people from the French division of EMI who put together the Americans Swinging in Paris series are right to place it first. 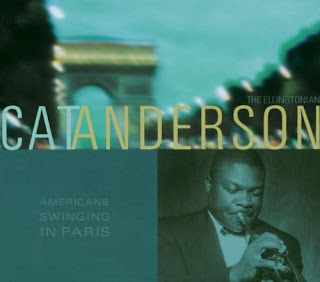 With Gonsalves in tow but fewer members of the Orchestra over-all, Anderson plays well over some excellent blues (which is also a helpful reminder of just how soaked in the blues Ellington always was) by some of the finest sessioners baseed in France. 'C Jam Blues', for one, hasn't sounded better since the Blanton-Webster recording, the shuffling piano manuevers of US exile in Paris Joe Turner providing the perfect accompaniment to some superb soloing from Anderson, Gonsalves, Procope and Buster Cooper. On opener 'A "Chat" with Cat', we're treated to Gonsalves expertly mimicking Webster's signature heavy breathing tenor sax style and only when everyone comes together at the end to attempt to play over each other does one get the feeling that this may not meet the standards of Ellington. Not to be confused with Ellingtonia*, another stab at honouring his boss, The Ellingtonian is in effect a Duke Ellington album with an overabundance of Cat Anderson solos. Making a virtue out of being trapped in an inescapable shadow, Anderson does an admirable job in the leader's chair, even if he's effectively acting as a proxy. Ellington may not have been there but he's very much present. * Cheers for adding to the confusion AllMusic. It's now been five years since I fully fell for jazz. Oh, I had begun to explore it a lot earlier but it was mainly on the basis of curiosity and following the recommendations of guides such as The Virgin Encyclopedia of Sixities Music, which, thinking back on it now, placed vital works such as Kind of Blue, Giant Steps and The Black Saint and the Sinner Lady more within the context of the rock canon, thereby still keeping me at a distance from jazz itself. The figures that grabbed my attention early on even managed to fit nicely alongside the giants of rock as well - Davis was dark and fearless, a more talented, less sleazy Jim Morrison; Monk was iconoclastic and playful in the vein of Syd Barrett; Coltrane pretty much set the template for the doomed rock star, albeit one with a spiritual quest, making him a sort of love child of Johnny Cash and Kurt Cobain. These comparisons, of course, are nonsense but that's what the search for parallels can do to a guy: if we can't find actual similarities, then why not make them up? I had gotten into much wilder, seemingly more adventuresome works - On the Corner, Free Jazz - previously but that is beside the point. The reason A Love Supreme seems to appeal more to listeners with a rock background rather than jazz purists is that they tend to value passion and feeling above structure and proficiency and the bulk of the jazz you'll lible to find on a Rolling Stone 500 Greatest Albums list operate as surrogate rock records. Jazz appreciated as jazz begins here. 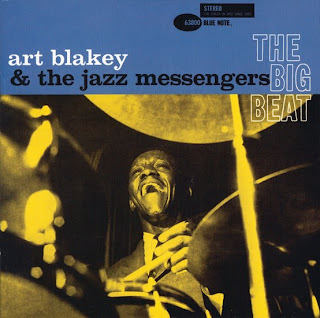 There is a famous story about how Art Blakey was out for a stroll and he happened upon a group of mourners at a local cemetry. He paid his respects to the deceased and then proceeded to tell everyone in attendance about his love for jazz. Apocryphal or not, this anecdote tells you all you need to know about what a tireless ambassador he was; listening to the Jazz Messengers turned me into one. There was once a time when a jazz musician recording a Broadway standard was, er, standard practise. If one did not have a masterful composer like Ellington at one's disposal than where else was one going to find material? The commercial aspirations of swing's old guard meant that blues-based tunes were often spurned in favour of popular numbers culled from Broadway, jazz's only serious rival in the twenties and thirties. Even well into the fifties was there a strong affinity for the show tune, particularly after Ella Fitzgerald and Louis Armstrong recorded Porgy and Bess. But seemingly overnight this tradition seems to have been altered with the release of John Coltrane's seminal My Favorite Things. Suddenly, the thought of a serious soloist embarking on such supposedly lightweight numbers as the title track and 'But Not for Me' became a novelty, one of music's first of many grand ironic statements. * Since then, the Broadway aspect of jazz has largely disappeared. In this landscape came Coleman Hawkins' On Broadway sessions, the sound of one man refusing to admit defeat. As is often the case, Hawkins managed to make the most of those compositions that offered him as little as possible. Opener 'I Talk to the Trees' (from Lerner and Loewe's Paint Your Wagon) is a minor but splendid recording, as delightfully light as 'Limbo Jazz' would be on Duke Ellington Meets Coleman Hawkins, recorded later that same year. Similarly, the winsome Richard Rodgers original 'Loads of Love' simply sparkles. Not that more substantive pieces don't have their charm: My Fair Lady's 'Wouldn't it Be Loverly' is probably the collection's best track, featuring some supple interaction between Hawkins and pianist Tommy Flanagan. Still, On Broadway feels far too long, the beginning scarcely remembered by the time you get to the end. 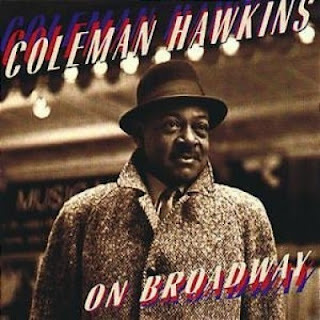 There's something too anonymous about each piece (or, perhaps, a bit too typically Coleman Hawkins) and you begin to wish that the tenorist had added the same kind of inventiveness that Coltrane had injected on to 'My Favorite Things'. As two separate albums, as it was originally released, it all works much better but I can't help but wonder why he didn't just try to recreate his favourite musical in its entirety rather than cherry picking a few choice favourites. It has to be said that Hawkins was probably growing somewhat out of touch by this point and all the better for it. While others may have taken the project lightly (considering what Coltrane was already up to in the same studio, this likely came as light relief for engineer Rudy Van Gelder), this is very much Coleman Hawkins in his element. There's also a statement of purpose here that few bothered to heed: namely, that jazz needed to regain its lost glamour and why not go back to Broadway to find it? * I've already argued that rather than being an example of Coltrane coasting, it was in fact the boldest creative move of his career but I'm in the minority on that one, even among fans of the album. While I have previously posited on the seemingly unthinkable notion that Louis Armstrong actually got progressively better with each passing decade, I have to acknowledge that his influence and fame had clearly peaked during the twenties and thirties. By the fifties, even Armstrong must have been aware of it although I wouldn't imagine that his current status in some circles for producing the Hot Fives and Sevens followed by a respectable but underwhelming subsequent forty years would never have occurred to him. Where, then, did this leave a still potent Louis Armstrong? Coming out of a so-so forties and flirting close to irrelevancy might have irreparably harmed a lesser performer but I suspect that he found it liberating rather than shackling. With nothing to prove he went out and pieced together a musical second coming that deserved to have the entire jazz world looking on in awe. I have also pondered elsewhere about the role that the album played on old school 78 rpm figures such as Armstrong and Duke Ellington. Both seemed to find the new medium advantageous, in some respects better suited for it than their younger, supposedly more ambitious contemporaries. 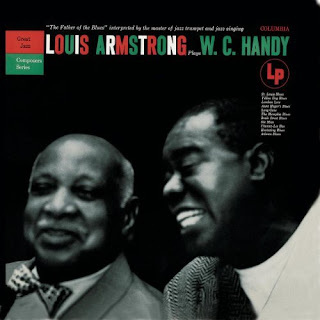 While Ellington used the long player as a means to stretch out his compositions into suites, Armstrong began to explore thematic approaches* of varying degrees of success (I've been assured that Louis and the Good Book is terrible but I'm perverse enough to find merit in it). But did the album rejuvenate him or was it simply his means for expressing this B-12 shot of inspiration? (It's possible that the L.P. gave him the excuse he needed to tip his hat to his own musical heroes.) Either way, it resulted in a sublime album, every bit as good anything else he ever did. Likely inspired by their employer, the All-Stars are absolutely superb on Louis Armstrong Plays W.C. Handy. Much has already been written on Armstrong's allegedly weak groups and orchestras - sometimes justified - but it's impossible to quibble with the group assembled here - and the fact that the trumpeter kept the unit together for a little while suggests he and his charges were happy with the arrangement, a welcome change from the revolving door he had in the thirties. Barney Bigard and Trummy Young, on clarinet and trombone respectively, deliver some excellent solos that while lacking the power and authority of their boss don't manage to get completely overwhelmed either, always the most you can hope for from an Armstrong backing unit. Velma Middleton, too, is at the top her game, her comic timing and sass a more welcome addition than it would be on Satch Plays Fats two years later - curious considering there's decidedly more humour on Fats Waller's compositions than on Handy's. Although Armstrong is, as ever, the star, he is so ably assisted from all corners that it seems to be his most group-like effort. Never one to be outdone, he blows with a torrential force, as great as any of his earlier, more acclaimed recordings. (Until proven otherwise, his trumpet solo on 'St. Louis Blues' is the most thrilling of his entire career.) And nowhere else does his playing mesh so well with his vocals, making this music he was simply born to perform. Interesting that on a tribute to W.C. Handy the biggest tribute being paid is to Armstrong himself. Never a prolific composer, his uncanny ability to breathe new life into tried and tested standards remains unmatched to this day. But these recordings didn't simply galvanize Handy's top-drawer compositions: they also brought a brand new sense of purpose and vitality to a performer who could have easily sat back in his dotage. Were that the case for more artists. * Rock fans will be dismayed to discover that the so-called concept album was had been mined by jazz and Broadway long before the Beatles clued in. But I'm sure they'll happily find ways to delude themselves further. All of the previous Monk albums in my collection were growers, though some of a very deceptive variety. I am still waiting for Genius of Modern Music, Vol.1, Thelonious Monk Plays Duke Ellington and Brilliant Corners, after months (and years in one case), to finally grow on me, as I've been faithfully assured they eventually will. And because this is Thelonious Monk I am still convinced it will happen. Until then there's Genius of Modern Music, Vol.2, Art Blakey's Jazz Messengers with Thelonious Monk and, now, Monk's Dream to satisfy me. Monk seems to be one of those scant figures who you daren't defame with criticism, a luxury in the jazz world not even reserved for Louis Armstrong. I suppose people admire his singularity and status as a maverick - as do I. The problem is, he rarely translated these particular qualities into the sort of delightful, crowd pleasing ditties that an earlier character like Cab Calloway did effortlessly. I suppose it's easy to not have to be a true showman when there's no one listening. While Monk's style had not changed a great deal, his group had and for the better. For a supposedly stellar figure of the bop era†, the pianist never seemed to get adequate support from his contemporaries. While Blakey cottoned on to the worthy idea of getting his charges to play in Monk's style, people like Sonny Rollins and Max Roach never seemed to get past that they were backing a bop demigod. On Monk's Dream, he's finally got himself a group that understood that they were playing with a figure of infinite complexity, far beyond the restrictions of one style. It helps, too, that tenorist Charlie Rouse, bassist John Ore and drummer Frankie Dunlop were well schooled in various orchestras and bands and, crucially, didn't seem the least bit awed in the presence of their boss. Like Duke Ellington before him, Monk benefits greatly from revisiting his work - a stark contrast from Charlie Mingus who could never seem to make going back more interesting than moving forward. 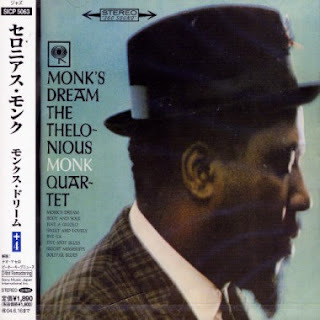 Today, we might see an album like Monk's Dream as little more than cheap filler or, worse still, the capitulation to a major label from an artist seeking to reap the rewards previously denied him. But the truth is Monk thrived on Columbia precisely because he was no longer given carte blanche to indulge. Commercial pressure forced him to tone down the more excessive passages on works like Brilliant Corners in favour of a lighter, more condensed sound. I may not be much of a Monk aficionado but this sell out approach does not seem to affect his work one iota. We'll have to see if it begins to shrink on me in the days and weeks and months ahead. * I only bought this album yesterday and thought it might be nice to wind down 2008 with some initial thoughts on my latest purchase. I imagine these slap dash observations will be added to in the near future. † I say supposedly because I've begun to doubt Monk's position as a full-fledged bop performer (as do many other jazz fans and critics). Just as Henry VIII is considered to a vital cog in the Protestant Reformation because his break with the church occurred at roughly the same time as Luther's, Monk just happened to arrive on the scene just as Parker, Gillespie and Powell were hitting their stride. I'd say they coincide but aren't the direct result of each other. As of late, my jazz collection has come to include artists bereft of fame. Not obscurities procured after a late night club gig, no, but individuals and groups lacking in notoriety and success nonetheless. Buddy DeFranco's conspicuous status as a minor figure is understandable considering he played the distinctly sexless clarinet but what about the MJT+3? How did a unit with such an abundance of talent manage to avoid even a cursory mention in jazz historiography? Well, their bizarre, Modern Jazz Quartet-aping name certainly does them no favours particularly when it's impossible to figure out what it actually means. * Jazz units have never been particularly well-named and I've often wondered how much that contributes to their relative lack of success. Then, there's their label, the hapless Vee Jay who managed to flirt with some nice signings in blues, jazz and rock but ceaselessly bled money (how they went bankrupt following their fluke gold strike with The Beatles defies logic). But the biggest factor of all is the MJT+3 themselves and their inability to decide on which path to follow. Their indecision makes for frequently fascinating listening but the corollary is that they aren't even a footnote. A brief introduction, Walter Perkins' MJT+3 acts as bonus tracks in advance to the more substantive and distinctive Make Everybody Happy. The lounge credentials of the musicians are well documented on the former but there are occasional hints that they yearn to break away from their roots and pound out some serious hard bop, particularly on the penultimate track, Harold Mabren's 'Rochelle'. Elsewhere, the playing is solid enough but largely forgettable, relieved only by some sporadically inspired playing from the quintet. But it is Willie Thomas' trumpet solo on 'Whiffenproof Song' that is the undoubted highlight of this set: his playing is at a such a high pitch that it's too much for the microphone enabling some unexpected distortion and left on the CD reissue either due to shoddy remastering or because I am not the only one who appreciates such a jarring moment. Make Everybody Happy is, in my own opinion, named for the group's valiant attempt at merging their own creative desires with Vee Jay's desire to cash-in. The very fact that it didn't make anyone happy at the time is now beside the point but indicates that they weren't far off from attracting an audience. It's possible, however, that any potential audience may have been turned off by the reverential playing. The polar opposite of its predecessor, this is the sound of a hard bop unit exploring lounge music, though much more successfully. As it was in my Young Lions review, Frank Strozier continues to demonstrate that he was one of the most accomplished - albeit forgotten - sax stars of the era. But while Coleman, Coltrane, Rollins and the like were established leaders given lisense to go full throttle, the less renowned Strozier was stuck within the confines of a group setting. His extended solo on 'The Trolley Song' is a tour de force history of bop, cool and hard bop, distinctive only in that he managed to sound like everyone before him. On an instrument as maddeningly individual the sax, it's nice to hear someone playing with a nod to tradition. But that's probably not the way it was heard then or, as it were, not heard. * So close is the MJQ connection that it's all that allmusic can bring itself to mention on the group's behalf - and this is generous considering Wikipedia doesn't even have an MJT+3 entry. We live in an era where there's just about nothing more irrelevant for an artist to release than a Christmas album. Mostly a cynical cash grab, it's easy to forget that your favourite group or singer even did one - and that's assuming they even bothered as it's a rarity particularly among artists with "integrity". * But it wasn't always this way. Much as I hate to admit it, Phil Spector's otherwise indulgent Christmas album is at least a game attempt at injecting a little of the crackpot producer's creativity. Brian Wilson, as he was wont to do, followed suit and delivered a better record than his mad mentor, one that stands up well against other pre-Pet Sounds albums. And Motown's seasonal treats were handled with the same care they put into their enviable hit factory.† But since then acts from the rock era have contributed almost nothing of interest to the venerable Christmas song tradition. Yet again we must look to jazz for more substantive efforts. Ella Fitzgerald took recording Christmas songs just as seriously as she took any other material. This harks back to a time when singers tackled a cover version as an artistic challenge rather than as a kindly tribute or a token gesture. Rather than being a pleasant diversion, standards were intrinsic to a good vocalist. The very fact that this now seems extraordinary speaks volumes for, while Fitzgerald did it better than nearly anyone else, she was hardly alone in doing so. Made up largely of secular material, there is much fun to be had particularly in a sublime rendition of 'Jingle Bells' and probably the still-definitive reading of 'Santa Claus is Coming to Town'. On the other hand, I've never heard such a compelling 'White Christmas': rather than being a Hollywood tycoon's whinge, Fitzgerald and Frank DeVol's orchestra turn it into an early paean to environmentalism: instead of being inflected with traces of self-pity, Fitzgerald's voice sounds sorrowful in the knowledge that she'll never see snow again. It's a side of the Irving Berlin standard I've never contemplated before, much less heard. Admittedly, the more religious-themed bonus tracks kind of detract from the original album's joie de vivre but it's nice to hear someone take on hymns without either a jokey irony nor a sickening piousness. 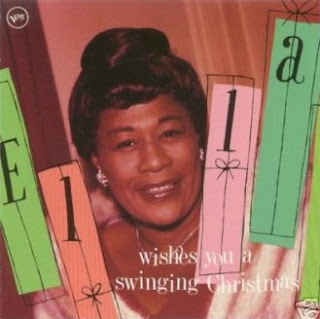 Ella Wishes You a Swinging Christmas is a throwback and one I wish would make it's return to popular music. Much like a white Christmas, I fear it's nothing more than a dream. * Typically, pop stars over the past forty years have done far more good composing their own holiday favourite than putting together a tired cover version. In some cases (Wizzard and Slade are still the prime examples), this has even resulted in an act's most famous and renowned work. † It's a mixed blessing that the Beatles never tried their hand at the Christmas album, especially considering their inconsequential fan club only seasonal discs. Still, it's a missing piece of their catalogue (the same way that there was never a Christmas episode of Fawlty Towers) no matter how minor and, considering their still-overwhelming influence, it might have resulted today's acts embarking on their own holiday albums.